Preysing studied law in Munich and Würzburg and entered the Bavarian civil service in 1906. Beginning in 1908, he studied theology in Innsbruck. He was ordained in Munich in 1921, and served in the church in that city from 1917 on. After receiving his doctorate in 1913, he served as personal secretary of the archbishop of Munich. In 1932 Preysing became bishop of Eichstätt; on July 6, 1935, he was named bishop of Berlin. As early as 1933, he criticized the confidence that Catholic bishops, clerics, and believers initially placed in the National Socialist regime. Later he also criticized the tactics of voicing grievances espoused by the chairman of the Conference of German Bishops in Fulda, Cardinal Bertram. Preysing belonged to the five-member commission that prepared the papal encyclical Mit brennender Sorge (With Profound Distress) of March 14, 1937, which condemned National Socialist church policy. The National Socialist rulers feared the frank sermons and pastoral speeches of the Berlin bishop, in which he repeatedly upheld the rights of the church and the dignity of all human beings. 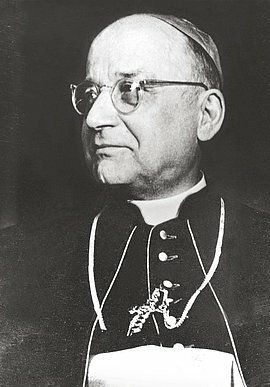 Preysing was one of the co-founders of the Hilfswerk beim Bischöflichen Ordinariat Berlin (Welfare Office of the Berlin Diocese Office) on August 24, 1938. He was personally responsible for the care extended to many Catholics of Jewish descent but also to unbaptized Jews. In 1940-41, Preysing protested against the murder of the infirm in letters to his priests. He remained unrelenting in his repeated efforts to persuade the other bishops to take a more determined stand against National Socialism. In the 1940s, Preysing also maintained contacts with the Kreisau Circle and opponents of the regime involved in the assassination attempt of July 20, 1944. Despite his open opposition, the National Socialist leaders did not dare to arrest Preysing. Several months after the end of the war, Konrad Graf von Preysing was named a cardinal.